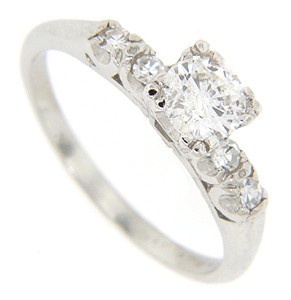 This elegant platinum engagement ring is set with a .58 carat, G color, I1 clarity diamond at the center. Pairs of gleaming diamonds adorn the ring’s shoulders. 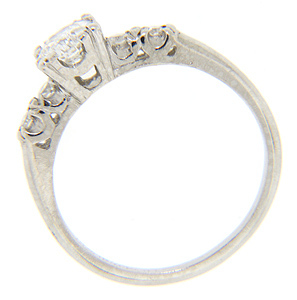 The ring measures 5.9mm in width and matches the wedding band WB1741 (sold separately). Circa: 1930. Size: 6 1/2. We can resize.